The Hebrew text of Scripture is filled with many linguistic and grammatical curiosities – glimmering details that typically do not survive the translation process, for several different reasons. Having access to the Word in its original form allows the attentive reader to see deeper than the surface translation and catch these peculiarities when they are confronted in the text. Doing so gives the believer the opportunity to investigate the depth of the language and hopefully perceive the Spirit’s intent in such instances – a glimpse into the boundless mind of the Most High in a manner not readily obtained if approached only from the confines and limitations of a translation. A testimony in Yehoseyf He appointed: when He went forth over the land of Mitzrayim I heard a language I did not understand. For anyone reading the Hebrew text, the nuance should leap off the page at them and cause them to wonder what is going on. The reason is that the Hebrew pronunciation for Joseph is pronounced YOSEYF, not YEHOSEYF as it appears here! The name Joseph appears 204 times in the Hebrew text of Scripture before this instance, and in every one of those appearances, it is always YOSEYF, never YEHOSEYF. After this instance, in the Hebrew text of Scripture it appears 9 more times, and it is again always YOSEYF. In this single instance only in all of Scripture do we read the very odd rendering of YEHOSEYF! When scholars address this unusual presentation of Joseph’s name, the result is typically something about it being just a poetic form of the pronunciation, and some even suggest it is the Chaldean form (Aramaic). The issue with such a simple explanation of poetic flair is that there is no other attestation of this form in all of Scripture. YEHOSEYF stands alone in the Hebrew corpus of Holy Writ, and as such, a hasty attempt to explain it away as a one-time poetic use does not adequately do justice to its sudden presence in the text. In similar manner, the Aramaic form of Joseph is not YEHOSEYF, but YASEF, spelled exactly the same as the Hebrew version, but pronounced slightly differently due to differing vowel marks between the languages. For these reasons I have endeavored to show in this study the depth of possible intent in this unique rendering of the name of Joseph, and in doing so, hopefully provide the reader with the ability to appreciate the intimate nuances the Spirit has variously placed into the living language of the Word of Scripture. ​​These three possibilities are based on the definitions allowable from the term SAF, which would be the second root if YEHOSEYF was indeed intended as a compound theophoric name. The original YOSEYF has the root ASAF which controls the definition of the name, but with YEHOSEYF, that root of ASAF would disappear and SAF would then have to be understood in its place connected to the theophoric YEHO prefix signifying Deity. ​What makes this whole matter somewhat strange is that, as mentioned previously, YOSEYF as a name only means “He shall Add.” It does not in itself possess the root concept for Deity at all, but when the letter Heh (h) is added to it to create YEHOSEYF, it looks exactly like names that are in actuality legitimate theophoric names, like the example shared above. There are even instances in Scripture where names start off as blatantly theophoric but are altered to lose that obvious spelling, just like the aforementioned Yehonatan / Jehonathan, which is later seen in Scripture to lose the letter Heh (h) of the theophoric part of its root and quiesce into the form of Yonatan / Jonathan. Several other theophoric names do this throughout the text of Hebrew Scripture. With YEHOSEYF, it would seem like the reversal is happening with the addition of the letter Heh (h), and yet it is incredibly strange because the original and majority version of YOSEYF never hints at ever possessing in itself a theophoric root! That makes the appearance of YEHOSEYF truly remarkable and worthy of further consideration. 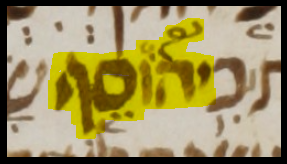 It would seem the scribe responsible for the image shared here attempted to highlight the unique presence of the letter Heh in the name YEHOSEYF by placing a distinct curled line emanating from the top of the letter – a feature not included on the surrounding appearances of the letter Heh in the psalm. The curious curl over the unique letter Heh in YEHOSEYF is intended to let the reader know that it should be viewed as a theophoric name, because further down into the text, in verse 11, there is a corresponding unique curl that emanates from the first letter of the Divine Name of YHWH, thus displaying the scribe’s effort to link the two, as no other such flourishes are used in the psalm. That makes this version from Psalm 81:6 (5) truly an anomaly to the Hebrew reader – one worthy of searching deeper to see what is really going on! To do that, let us look at the text of Psalm 81 with the possible definitions of YEHOSEYF in mind, and see what might come to light in doing so. For the leader, upon the gittith. Of Asaf. This song was composed by a man named Asaf. His name literally means “Increaser,” and comes from the same root as the name YOSEYF – the root ASAF! This initial connection in the psalm helps to cement in the mind of the reader that YOSEYF is intended by the term YEHOSEYF, so that we cannot forget the root meaning of “add / increase” that forms his original name, but also that something more is actually going on in the psalm that we are supposed to realize if we carefully look at the content, due to the fact that his name appears in altered form, and thus, altered meaning. The Hebrew text of the above verse has a term in it that might not immediately strike us as important, but upon further investigation, is seen to be totally relevant. The word translated as “language” is the Hebrew SEFAT, which while it can indeed refer to what is spoken, literally it holds the simple meaning of the body part called the “lip” – a definition it possesses more than any other of its usages in the Hebrew text. In this context it connects to the appearance of YEHOSEYF in regards to the definition of the name as “Yah Feeds,” for food must passes through the lips and into the mouth. Additionally, there is the deeper, more archaic linguistic connection here that travels back to that of YOSEYF in its ASAF “Add” root, in that SEFAT, although spelled Shin-Peh-Tav, is an alternate form arising originally from SAFAH, spelled with a Samekh-Peh-Heh, and linked to the “lips / mouth” concept due to the meaning of “adding / consuming” that takes place in it, which is the definition of the term SAFAH – thus circling back to the root ASAF concept of YOSEYF! I removed the load from his shoulder; his hands passed over the pots. In this verse there are two aspects discussed that link straight to the possible meanings of the form of YEHOSEYF. The unique theophoric name could mean either “Bowl of Yah” or “Yah Takes Away.” Both possible meanings fit in the context of the verse, which speaks of a load being removed by Yah, as well as the mention of pots not being handled. The name YEHOSEYF, in two of its different possible meanings, connects to these two aspects of the verse’s content, right after it appears in verse 6 (5 in the English). I am YHWH your Elohim, who elevated you from the land of Mitzrayim; open wide your mouth and I shall fill it! This time, the content of the verse aligns with two possible meanings of the version YEHOSEYF – “feed” and “take away!” It aligns with “Yah Takes Away” in regards to elevating the people from Egypt to Canaan; it aligns with both “Yah Feeds” in regards to the command to open the mouth and have it filled with food. Unfortunately, He is unable to fulfill the third option in this desire to be all three aspects of the meaning of YEHOSEYF because the people of Israel did not obey Him. And He should have made them to eat from the fattest wheat, and from the rock made you satiated [with] honey. The contents of this verse regarding the eating of the wheat and the consuming of the honey align with the meanings of YEHOSEYF concerning “Bowl of Yah” and “Yah Feeds.” It is interesting that the text again does not include the third option of YEHOSEYF’s possible definitions – that of “Yah Takes Away.” It may be that the third was not included because the song ends on a reprimanding note – bemoaning the fact that Israel did not trust implicitly in the Most High and obey His teachings. Had they done so, His nature exemplified in the definitions of the YEHOSEYF could have been truly and fully realized for them. What can be seen from these things in the psalm is that which the Holy One wants to do for us. He called the nation of Israel by a unique version of the name of Joseph that never before was used, and never after was employed. The version and its surrounding context display that while we may have started our identity in this world as one thing (YOSEYF), we can be elevated through His goodness when He includes Himself in our lives by trusting and obeying Him to something even greater (YEHOSEYF). He desires to meet all our needs: to provide for us, to feed us, to take away our enemies and bless us in myriads of ways we cannot yet fathom that will further His Kingdom on this earth, but we must show Him that we are placing ourselves completely in His care, and not attempting to follow the lusts of our hearts nor walk in the insufficient standards of our own fleshly counsels. Rather than being merely a linguistic anomaly in the Hebrew text, the version of YEHOSEYF here points us to a much deeper spiritual truth. This one unique alternate version of YEHOSEYF instead of YOSEYF is a testament to what He has for us when we take the time to appreciate Him as more than just a cultural icon or a family Deity. When we make the effort to embrace His mastery over our lives – to include Him in the most basic of our needs, more is added to us than religion – we are given a relationship with His very Presence embedded within us (YEHOSEYF) that proves it worth every moment of sincere submission to His ways!